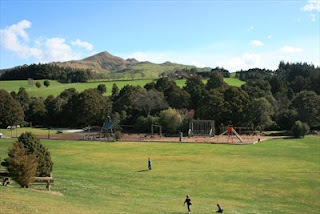 In January 2012 around 120 people camped on Mike Dunbar's farm in the middle of the Mataura Valley. Mike had refused to sell his family farm to Solid Energy so that they could access the lignite beneath it and the campers were determined to support him and demonstrate their concern regarding the climatic effects of using coal. 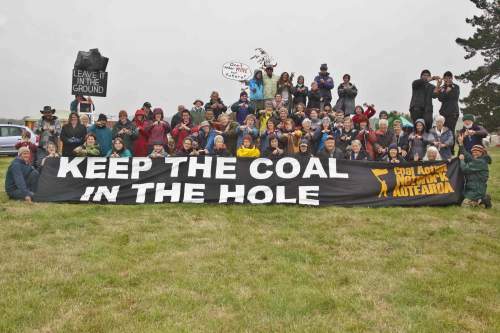 The gathering was called the "Leave the Coal in the Hole Summer Festival" and was organised by the Coal Action Network of Aotearoa. The event created a good deal of concern for Solid Energy and the local police. There was a high level of security around the New Vale Mine and Solid Energy's partially constructed lignite briquette plant and a number of police were assigned to patrol the area. We had borrowed marquee tents from Meridian and the BNZ and both company's were contacted by Solid Energy with demands that they withdraw their support. We were asked to take down both tents but local support meant we had replacements erected shortly afterwards at no extra cost. Solid Energy obviously expected some sort of direct protest action and there was some concern from the local community regarding what this bunch of "protesters" were going to do. What we did do was a surprise to many, we hired the Mataura Community Centre and organised a public forum with presentations from scientists, a medical specialist and an Australian farmer with direct experience of the coal industry. Solid Energy had done very well in getting the local community on board with promises of jobs and sponsoring everything from the annual Gold Guitar Awards in Gore to school events, but was very vague around the environmental consequences of their activities. The people of Gore and Mataura who attended the presentations found they were provided with another view of the coal industry that they hadn't heard before. Rather than emotion and placards it was information and genuine concern for the future of the region that was presented instead. A year has passed and there has been a dramatic turn around in the fortunes and reputation of both Solid Energy and the Coal Action Network. Solid Energy has suffered greatly from the downturn in international coal prices, it experienced a $40 million loss and had to close a mine and layoff over 400 staff. The $30 million briquette plant has had multiple managers, is yet to open (months behind schedule) and still has no market for the end product. Solid Energy were relying on the partial sale of the SOE to fund the construction of urea and diesel plants in Mataura but with its drop in profitability, the legal challenges from Maori and success of the citizens initiated referendum petition an influx of capital isn't likely. Solid Energy have indicated that they may even sell the Mataura farms they had bought. SE's PR and credibility have taken a dive and the future of coal is decidedly shaky, especially when Australia (long held up as a model for New Zealand) has invested far more into renewables, introduced a carbon tax and has signed up to the Kyoto Agreement again. Written many letters to the Southland Times and clearly won a public debate (via letters) with the pro mining organisation, Straterra. Made a well received presentation to Environment Southland. Supported the launch of the WWF funded Berl report on a low carbon future for Southland. 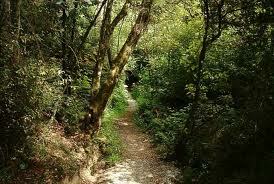 Wrote submissions to the Environment Council and District Council plans. Networked with a range of groups including Federated Farmers and Forest and Bird. Had an information stall opposite Solid Energy almost every time they ran one. Supported the collection of signatures for the CIR. 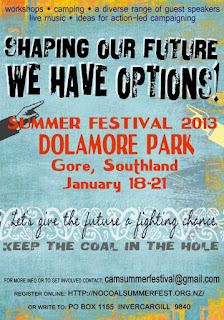 Coal Action Murihiku is organising another festival Shaping Our Future, We Have Options (18-21 January) to maintain the momentum that was established at the last one. Although some battles have been won, the war against carbon is ongoing. While coal and lignite mining are on the back burner (pun intended) there has been a shift to the potential of fracking and the Government has opened up an area in Northern Southland for oil and gas exploration. Although the Evironment Commissioner's review of the industry did not call for a moratorium she did flag some concerns around regulations and monitoring. Visitor Drew Hutton shared some concerning stories about the Australian experience of fracking that we wouldn't want repeated here. It is clearly obvious to those of us who are concerned about climate change and the declining state of our environment that we need to continue being vigilant. Solid Energy had bought both farms and the local community before many of us realised what was happening and it could easily happen with fracking if we are not careful. Holding another festival and public information day is important for maintaining our activist communities and making sure that the public doesn't slip back into complacency. 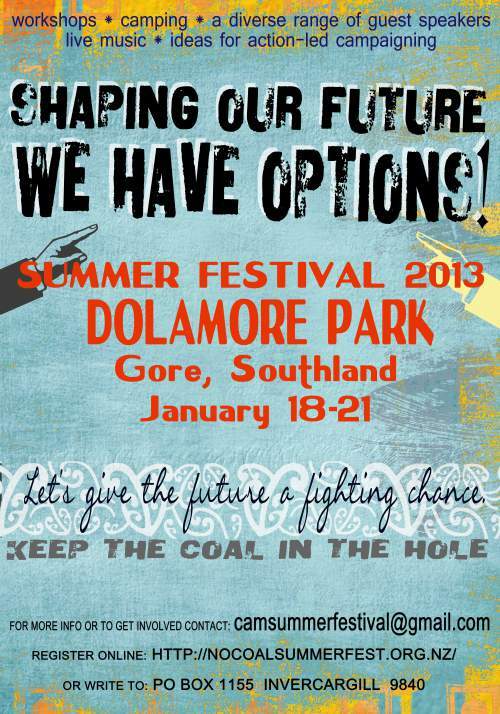 Those attending the festival will hear about the clean alternatives for Southland's (and New Zealand's) future economy and how successful campaigns have been run in Australia against exploitative oil industry practices. One of the keynote speakers is Australian Rob McCreath who lead the Friends of Felton lobby group in a successful campaign to protect valuable farmland from a Chinese mining company. If you haven't registered already it's not too late. The camp environment is within the beautiful setting of Dolamore Park and the public day will be in the Gore conference centre. There will also be time to relax in the evenings and listen to a range of entertainment. On Saturday night the Southland duo The East will be performing, they impressed last time so we got them back again.